Massages are not only great at helping us to relax and unwind but also play an important role when it comes to health. For thousands of years around the world, particularly in India, practitioners of Ayurveda have been promoting the health benefits of oil based massage. Over the last century the popularity of massages has swept the globe; but why are massages so good for our health and what oils should we be using? During a massage the skin is covered with a light coating of oil and the muscles are subjected to stimulation and pressure. This helps to increase blood circulation and relax tense areas. This increased circulation helps to deliver more oxygen to tissues and speed up healing times after muscle damage or intense physical activity. The correct choice of oil is a very important part of any massage, with different oils offering varying effects and benefits to our skin. At room temperature coconut oil forms a hard white solid wax but when in contact with the warmth of the body it quickly transforms into a light liquid oil. It possesses a high concentration of medium-chain fatty acids that help to make it one of the most stable oils available. In addition, coconut oil contains antimicrobial properties that help to protect us from bacterial and viral invaders. Another key benefit of coconut oil is its ability to help moisturise our skin creating a stable barrier preventing moisture from escaping. It is easily absorbed by our pores where it can help to repair cracked, flaky areas as well as being packed with vitamin E and antioxidants to help to reduce visible signs of ageing. Because it penetrates the skin easily it is ideal for use with essential oils carrying them deep into the skin and it has a very mild, pleasant coconut odour which won't compete with the smells when used with essential oils and on it's own won't leave you smelling like a chip-pan! The final benefit is that (unlike other oils) coconut oil does not spoil or go rancid which could smell bad and invite infection. 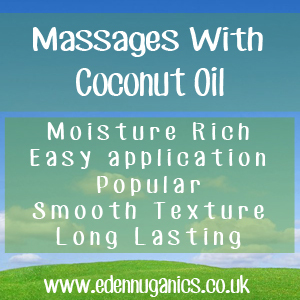 All these things combined render coconut oil a very suitable choice for occasional use/massages. Simply warm a coin sized lump of coconut oil between the palms of your hands until it has become a liquid and then massage into the desired area. A little goes a long way so it's also an economical choice. Don't forget to always massage in the direction of the lymph nodes and the direction of the blood pumping to the heart when massaging. The lymph nodes are situated in several areas in the body including the armpits, groin and backs of the knees. Jojoba Oil - Jojoba is actually a wax extracted from the seed of the jojoba plant. The antibacterial properties of jojoba make it particularly beneficial to people suffering from back acne. Like coconut oil jojoba has a very long shelf life, making it a good choice if you don't use it regularly. Shea Butter - Extracted from the seeds of a shea tree, this unique oil possesses a wide range of health benefits. Like coconut oil, shea butter is solid at room temperature but quickly turns to liquid at body temperature. Shea contains a natural latex, so people with latex allergies should do a patch test before using it.